The Handi-Man Bosun's Fastener Kit contains 16 different sizes of the most popular Phillips Oval and Phillips Pan Self-Tapping Screws. 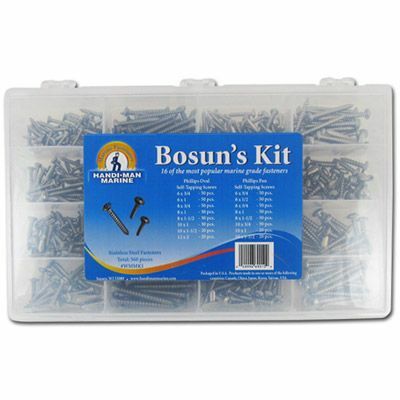 Total of 560 fasteners, packed in a durable plastic case. Kit Dimensions: 4" x 8-3/4" x 1-7/8"
Kit Dimensions: 14" x 8-3/4" x 1-7/8"